Why Do So Many People Still Struggle to Access Clean Water? It seems incredible that it’s 2017 and there’s still 663 million people around the world who don’t have access to clean water — a basic human right that no one can live without. In the lead up to World Water Day, March 22, 2017, our partners at WaterAid released a report ‘Wild Water,’ outlining why so many people struggle to have safe drinking water. It examines how climate change and extreme weather such as flooding, drought, and cyclones will make reaching a reliable source of clean water an increasing challenge for remote and rural communities in particular. 1.) Lack of infrastructure and poor management of services. Efforts have been made to reach more people with more water. However governments need to do more in ensuring water supplies are sustainable and commit to improving infrastructure. Access to water, sanitation, and hygiene are a basic human right and yet some people are still unable to access these services due to their ethnicity, gender, social status, disability or inability to afford the high costs. Climate change and an increase in unpredictable and extreme weather is a growing challenge. Long periods of drought affect clean water supplies while flooding can pollute clean water sources and cause outbreaks of disease. The world’s population is predicted to grow to 8.5 billion by 2030 and 9.7 billion by 2050. This is going to create a high demand and put a strain on already scarce and fragile water sources. Can you imagine living without water? No, because that would be impossible. Here’s what happens when your water source is insecure and unsafe. In many communities girls are tasked with collecting the households water. If supplies are scarce or the community is isolated it means girls are spending hours of their day to walk great distances to collect water from streams, rivers and unprotected wells. This means less time for paid work and going to school. Rural communities who rely on farming for their livelihoods are the most vulnerable to climate change and water shortages. Increased temperatures, changes in season, and prolonged dry spells affect crops and livestock and therefore a person’s ability to earn a living. 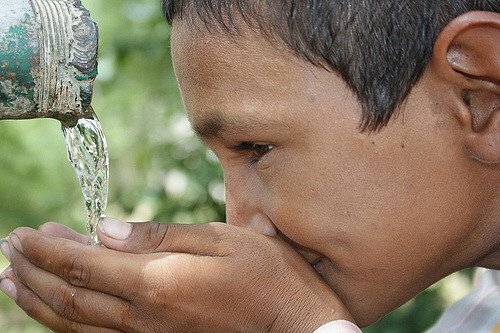 As the effects of climate change and rising temperatures increase, so does the prevalence of waterborne diseases such as cholera and trachoma. The World Health Organisation also warns that incidences of mosquito-borne diseases such as malaria and dengue will also rise. Another impact of unsafe water, inadequate sanitation and poor hygiene is malnutrition. In fact up to 50% of malnutrition cases are said to be a result of this. Together with our partners at WaterAid Australia, Global Citizen asks you to #GoFor6. That is, help achieve global goal number 6, and make universal access to clean water and sanitation by 2030 a reality. We are calling on the Australian Government to make access to water, sanitation and hygiene a priority. Because no one no where should be expected to survive without water.